This tutorial explains how to import scores into an existing assessment in AT&S. To learn how to import scores into multiple assessments or to create one or more offline assessments and load their scores, see Import Assessments and Scores into AT&S. Go to AT&S and click on Grading. 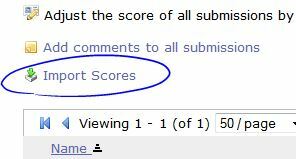 Click on the “Import Scores” function available in the Global Actions area. You will then browse to select and upload your spreadsheet CSV file. For information on the proper format for the file, see below. You will have a chance to preview the data and confirm the import of the scores. The file format for importing scores into AT&S is the same for both multiple assessment creation and score importing and for single assessment score importing. The file must be a comma separated value file (CSV). The first row of the file must contain headers. The headers are described below. The student’s login user ID. Any rows of the file for which the Student ID does not identify an enrolled student in the course site will be skipped on import. Tip: A fast way to get started with a file that includes your students’ ID’s is via the gradebook’s Export in CSV function. It includes the proper Student ID column and columns for all assignments. Etudes will ignore extraneous columns and entries for other assignments. The file may contain columns for other assessments. Etudes will ignore extraneous column data, and will import scores for the selected assessment only. The confirmation view will display the scores that will be logged for each student. If you are happy with the entries listed, click on Import at the bottom (or Cancel to abandon the process). Any lines of the file that are not successfully interpreted will be flagged with a reason, and will be ignored if you choose to import. Note: The scores uploaded represent the final scores for an assessment. In other words, if an assessment consists of many questions, each worth different point values, the import function does not award points to students for each question, but rather logs or updates the score in the Final score column only.